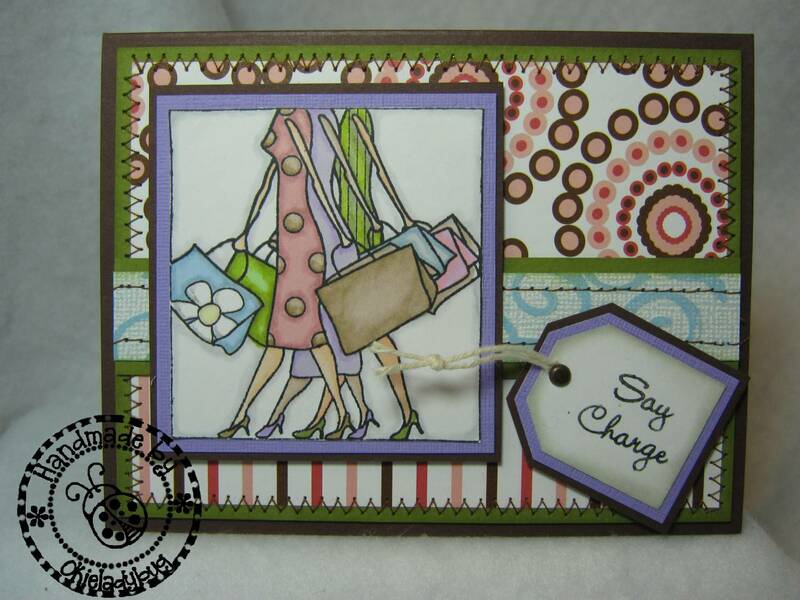 Okieladybug's Scrap N' More: Promarkers....I think I'm in love!! I was recently contacted by Letraset about trying and reviewing their ProMarkers, which are alcohol based permanent markers. 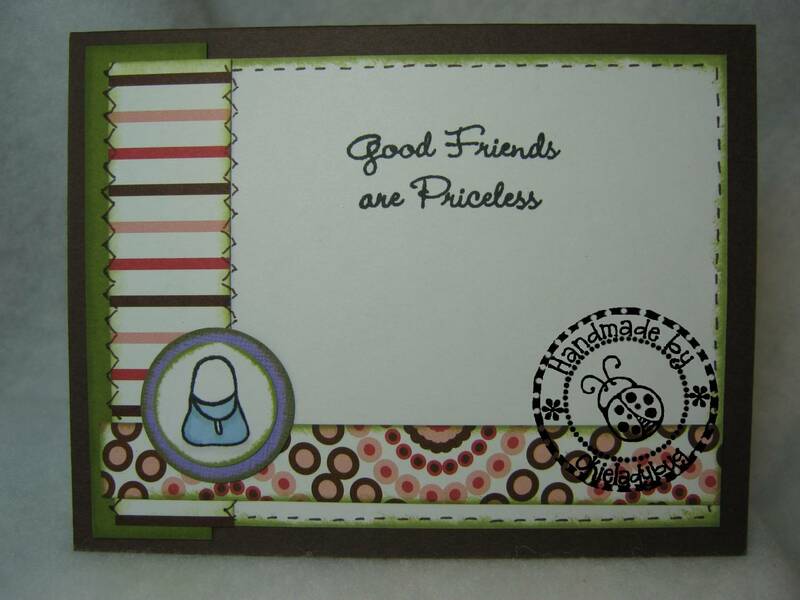 I have seen items where the markers were used and have been intrigued but me being the choosy person *okie things choosy sounds so much better than cheap* I am I figured I would stay with my Stampin Up! 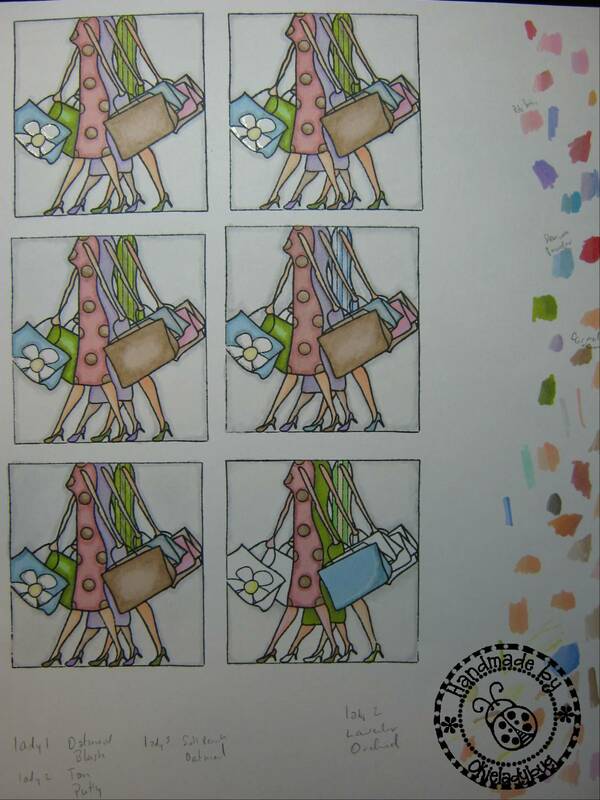 markers, which are water based. So when I was asked to try a sampling of the ProMarkers I thought I would give it a shot. 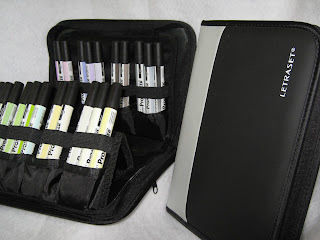 I received several markers in these nice little cases which are great for standing up the markers while you work. First off let me tell you that I only give honest opinions about products on my blog. I beileve you guys have grown to trust me over the years so I am sure not gonna tell ya I like something when I think it is crap. With that said.....I LOVE THE PROMARKERS!! I was a little intimidated at first but practiced at blending a few colors before starting to color my images. I stamped off several images in hopes of getting at least one good one to use on a project to show you guys. I actually ended up making 4 cards from this sheet. As I figured out what colors I liked blended I wrote the colors down so I would remember which to use. You can see the bottom right hand image isn't finished. I used it mainly for practice. The layering of colors did take a little practice, but really not much. I watched several video's and looked at a couple websites to see how others do the coloring process. And to tell ya the truth there isn't a right or wrong way. It all depends on personal preference. Here is my finished card! I think next time I am going to pick my papers first and then use my ProMarker colors from there because I sure ended up with a strange color combo but it seems to work out okay on the finished product. 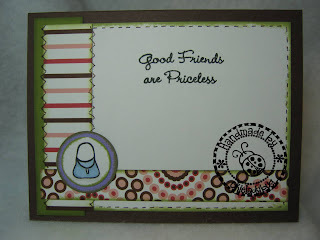 The patterned paper is by Luxe, and I also used Prism cardstock, Stampin Up! 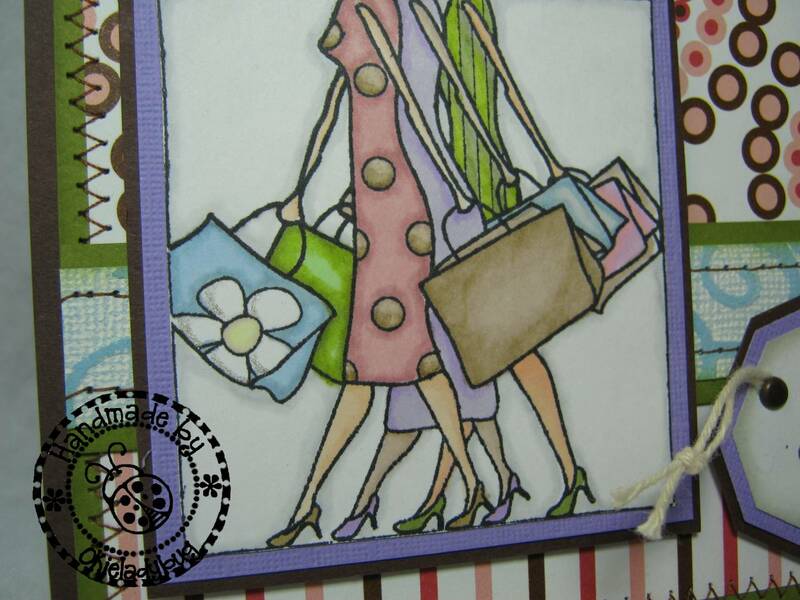 cardstock and Coredinations White Wash. 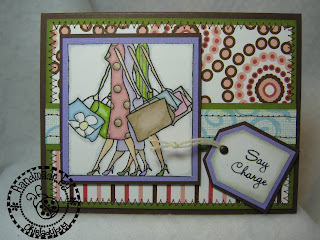 The image is from My Favorite Things and is the Say Charge set. Here is a close up of the image where you can see the shadowing better. And you know the best part? I didn't need any special cardstock! I just used the Georgia Pacific cardstock from Walmart and it took the makers wonderfully! Oh I did stamp the image with Memento Ink, I was advised that this ink works best as others might bleed.Make sure you click on the picture so you can see the details better. here is the inside of the card. I was so excited about it that I even decorated the inside and ya'll know that is something I rarely do! *okie is comfortable with her laziness*. I am really looking forward to using ProMarkers more in the future and plan on doing a video showing how I use them to color images. I guess that can be my weekend project! Thank you. I can not aford the copic markers. So I am always looking for a more cost effective one. Do you happen to know the cost of these. Once again thank you for all the time you give to all of us. Sue I think they come up to about $2.27 each on the ProMarker site, but I think someone on the Cricut MB found them cheaper. I will check and see and post the info when I find out. I"m getting ready to place my 3rd order today. Ypu can get them at carpediemstore.com for $1.49 apiece. Shipping is very high, though, so if you have a local friend to order with, it helps. I"m still not very good at blending and shading, but I figure I just need more colors :). What were some of the best videos you watched? Can't wait to see yours! I wish ProMarker would send ME markers and holders! Hi Shirley, I inherited a bunch of ProMarkers from my daughter who used them when she was in an Interior Design program. She decided to go into teaching instead and I got lucky with a lot of gooooood stuff :) With the ProMarkers, you want to be careful when buying them because the tips differ. I also have Prismacolor and Tria alcohol based markers so there are a number of options as alternatives to the more expensive Copic markers. Even at $2.27 that is substantially less expensive than the Copics. Thanks for sharing this with us, Okie. I love the look of Copics, but not the price so I've been avoiding them. These look like a great alternative. Thank for sharing the cards look very nice! Dear Okie, could you please tell us where you got the dog Santa outfit from your pics the other day? Can't wait to try these out next Thursday! LOL! If you decide to order some let me know------if these won't streak like the SU water based ones I'm definitely interested in them! But you know I'll never figure out how to shade with them! I'm off to check out their website and see what colors they have, how many, etc. QUIT SHOWING ME NEW STUFF!!!!!!LOL! Linda they do NOT streak!! I will gladly bring them and let you try them out. They are really easy to use. The dog suit came from Walgreens a few years ago. The Promarkers are like Copics, both are alcohol based. Looking at the tips on the markers---one end is chiseled and one is pointed---how does the pointed end compare to the SU ones? Is it as small as the fine tip on the SU markers? Or more like the tip on a BIC or Sharpie? I'm defintely interested since you say they don't streak! 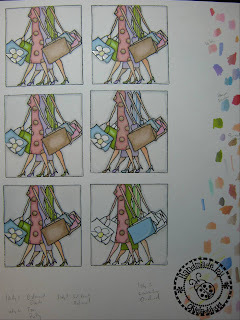 Hate that when I use my WM cardstock and SU water based markers! The markers are dual tipped. The fine point isn't as fine as SU and might be a little finer than Bic's. Will have to check that out and let you know. Great job Okie, I know that Enfys uses these also. Thanks for your honest opinion. 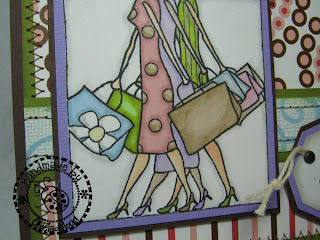 Gorgeous cards, Okie! I like the colors you ended up with. They all go well together for a cheery card. Awesome card! Thanks for sharing this info. I have wanted Copics but can't afford them. CRAP! I said I wouldn't get into Copics because they are too expensive & I haven't I've been good, saved $. I included all alcohol markers into Copics. Apparently, these alcohol markers are just as good if not better but cheaper and now I need the WHOLE SET! Your fault! $1.87-$2.27 awesome price. I can afford that... kinda. Promarker knew who to call didn't they? LoL. Thanks for your review on these markers. Your coloring looks great! I'd love to buy some, but it will have to wait. I splurged not too long ago on prismacolor pencils for card making so I can't justify these...hopefully someday. I absolutely love my promarkers. I have 44 markers and 8 copics and I love the fine tip on the Promarkers. I spent about $70 for the 44 markers and $40 for 8 you do the math. I hope more word gets out on how great they are. Not as many colors but they are great! Have Fun Okie! I like how the card came out ! This is something to put on my wish list. I hope you do more using the Promarkers. Thanks for sharing it. Oh wow! I have been buying Copic and I love them but they are way too expensive. I will have to try these. Both are alcohol so they should blend together. OK, I'm sold. If you like the markers this much, they must be some mighty great markers! I honestly trust your opinion! Enfys also highly recommends them. BTW, the card is great too! Your card is beautiful...you did an excellent job. These look like great markers. Such a nice job for a first try run! Looking to see what else you do with them.